Piglet dress up as a cowboy. Be sure and have a look at my other winnie the pooh items. Measures approx. 9" tall tush tag is attached. Cost and shipping time vary from province to province. Top Rated SellerBrand: Fisher-PriceSize: 9in. 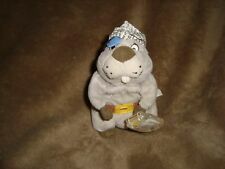 Winnie the Pooh Gopher Pirate Fisher Price 2000 Mattel Star Bean 6"
Top Rated SellerBrand: Fisher-PriceSize: 6in. Most of them have buttons on the jacket and this one also has a pointier nose. Don't miss this one! This is mint and not to be missed! 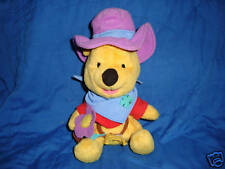 Winnie the Pooh dress up as a cowboy. Be sure and have a look at my other winnie the pooh items. Cost and shipping time vary from province to province. It is being sold in good used condition. Top Rated SellerBrand: Fisher-PriceSize: 7in. Walt Disney World Disneyland Resort Winnie the Pooh Teddy Bear Bean Bag 10"
Disney Winnie the Pooh Libra Justice w/ Scales Plush Beanie Toy! Disney Winnie The Pooh Plush Bear 24” Tall Red Pooh Shirt Stuffed Animal MINT! Don't miss this one! This is mint and not to be missed! New ListingVtg Disney Winnie The Pooh Plush Pajama Stuff Bag Honeykids UK 20"
I love a good treasure hunt! You never know what you might find! Hook and Loop closure works. I attempt to be thorough about this, but I am human. I have mostly had good luck with buying things. I also take into consideration what I paid for it though. From United StatesBrand: DisneySize: 20in. SIZE: 38"High (100cm) ， 32” (80cm) high when sit. Giant Plush Winnie Bear. Material : Plush 100%cotton. Super Cute bear, a perfect gift for your lover. We are very willing to accept everything. and I will do my best to help you to solve the problem by communication. So only by friendly communication，is to resolved the problem a good way. communication We will respond within 24-48 hours. He is number 754 of 5000 made. Disney Store Winnie the Pooh Bear 'Back to School' Soft Plush Stuffed Doll 10"
This Winnie the Pooh doll is in excellent condition - has no tears, stains nor bad odors. Excellent - Very minor signs of previous use. Very Good - 1 or 2 minor flaws, otherwise excellent. Gently Used - Obvious signs of previous use/washings but no other flaws. Disney Winnie the Pooh plush bear. Yellow with red shirt. 12" tall sitting. Condition: good pre-owned condition. Winnie the Pooh plush toy stuffed animal red corduroy shirt Disney Store 10"
R. John Wright Pocket Pooh Winnie the Pooh Doll Limited Edition MIB W/COA NR. Shipped with USPS Mail. Smoke free. This is #0420 out of 5000. Rare collectible at an amazing price. WINNIE THE POOH 14" SIZE. R. John Wright. R. John Wright "Pocket Piglet". This is a great looking pocket-sized doll in "new" condition.yes, it looks like it was never taken from its original box until I photographed it! Includes certificate, pouch, rabbit. Pre owned but in amazing condition. This one is numbered 809/1000. Don't miss this one! This is near mint and not to be missed! Plush bear that sits up. With University of Michigan vest that is removable. R. JOHN WRIGHT 57th annual UFDC National Convention SILLY GOOSE TALES L'ENFANCE DE BECASSINE Tag signed by R John Wright NUMBER 82 of 400 IN HER BOX AND THE SILLY GOOSE IN BAG BOTH HAVE COA'S I SAY USED BECAUSE I AM NOT THE FIRST OWNER Name: La Enfance de Becassine© (The Childhood of Becassine©) Description: 12"; all felt; fully jointed; molded felt face with hand painted features; mohair wig. Dressed in felt and cotton provincial costume with felt and leather boots. Date of Release: 2006 Edition Notes: Ltd. Ed. 400. Made under special permission from the copyright holder and publisher, Gautier-Languereau/Hachette Jeunesse, for an exclusive UFDC (United Federation of Doll Clubs) dinner event held during the 57th annual UFDC National Convention, Dallas, TX. ©R.JOHN WRIGHT DOLLS, INC. All rights reserved. R. John Wright CHRISTOPHER ROBIN SERIES II LTD EDITON 327 of 500 18", molded felt, fully jointed, raincoat, rubber boots MISSING THE UMBRELLA NO BOX PLEASE ASK QUESTIONS COLLECTOR PIECE IS In Vintage GREAT condition CPSIA disclaimer: Adult collectibles - NOT intended for children The Shipping is by PRIORITY U.S. Mail I ship next day after payment I guarantee all of my items so please notify me if there are any problems with your purchase. I will gladly combine multiple purchases to save you shipping costs. Payment is expected within 2 days of close of auction. Pay-Pal only Please ask questions as I want you to be happy with your purchase. Remember these are vintage and I want 5 stars. 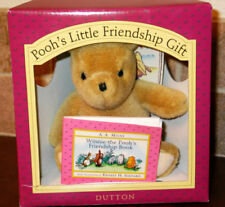 Adorable 9” artist Pooh Bear made of string cotton jointed mint with artist tag - so cute! You are looking at this John Wright Winnie the Pooh Vintage. 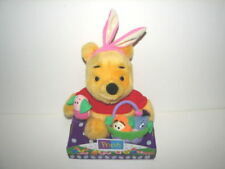 Who is in excellent condition has his tags but I do not have the box I’m very sorry.Pooh Bear is 8 inches. I am the original owner they are clean no odor at all please email me with any questions you may have and thank you for looking. This is a great price for both pieces. Producing country: Japan. Notes: dishwasher can not be used. In very good pre-owned condition. I could find no holes or stains. If you're not 100% satisfy with our products, you. Good used condition. No holes or stains. 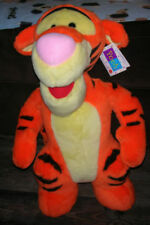 You are purchasing a Walt Disney World Disneyland Resort Winnie the Pooh Teddy Bear. This R. John Wright 1998 Limited Edition Winnie the Pooh is in amazing condition. He is #40 of a limited edition of 2500. Bag is in great condition. He is part of the R. John Wright Winnie The Pooh collection and was released in 1996 in a limited edition of 3500. R. John Wright Pocket Eyore. Disney Winnie The Pooh Collection. by R. John Wright. Based on the "Winnie-the-Pooh" works. Top Rated SellerFrom United StatesBrand: DisneySize: 15in. 7.5” jointed R John Wright Pooh marked nighttime Pooh w button. Excellent clean condition very cute and life like! Winnie the Pooh Zodiac stuffed badge. [Tokyo Disney Resort Limited]. Region code is DVD: Region 2 / Blu-ray: Region A. Expedited (EMS). Eyes have light scuffs as pictured. Cotton exterior with firm stuffing that allows the bear to sit up unsupported. There is a 3.5" seam on the bottom of the right leg (pictured). I believe this is where it was stuffed and sewn up. 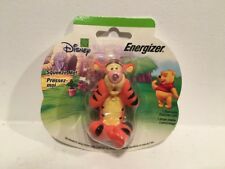 Pooh requires 4 AA batteries not included. Pooh along with the Book teaches MUSIC WORDS LETTERS NUMBERS SHAPES. HTF, Classic Pooh collection from Gund. SIZE: 39"High (100cm). Giant Plush Winnie Bear. Material : Plush 100%cotton. Super Cute bear, a perfect gift for your lover. Size100cm / 39". We respond ASAP within 24 hours (except weekend). Item must be in original, unworn, unaltered condition. Lot of 3 Winnie the Pooh Plush Toys. Very huggable! This adorable trio thrives on lots of affection! Vtg Disney Winnie The Pooh Plush Pajama Stuff Bag Honeykids UK 20"
If you are looking for a certain Teddy Bear that lives in the Hundred Acre Wood and absolutely loves honey, then you might like the various sizes of Winnie the Pooh teddy bears, ranging from three inches to 32 inches. 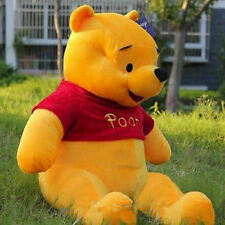 You will find Winnie the Pooh available in stuffed animal form along with several other characters from the franchise. Winnie the Pooh was created by the English author A.A. Milne in 1926. Milne's son, Christopher Robin Milne, and his teddy bear are the inspiration for the book series. Christopher Robin Milne's bear was named after Winnie, a bear he saw often when he visited the London Zoo. The rest of Christopher Robin's toys such as Eeyore, Tigger, Piglet, and others were also featured in the series. The real Christopher Robin's Winnie the Pooh did not wear shirts, but the famous red shirt was added to the teddy bear in 1933. Which of Winnie the Pooh's friends are available? Eeyore: A good friend of Winnie the Pooh's, Eeyore is often considered to be pessimistic, but the donkey's loyalty knows no bounds. Piglet: One of the bear's best friends is Piglet, someone who is known to be afraid of the unknown and quite cautious. He often spends time learning to be brave through others. 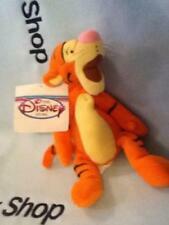 Tigger: A tiger that is often considered to be the opposite of Piglet, Tigger is wild and adventurous. He is the only tiger in the Hundred Acre Wood. He often brings life to this cast of characters. Christopher Robin: You can also get Winnie the Pooh's owner Christopher Robin as a stuffed doll. The bear's owner and arguably his closest friend visits the Hundred Acre Wood to see his friends often. What versions of Winnie the Pooh are available? The original unclothed version of Pooh as well as a Winnie the Pooh with the red shirt are available. Mattel: This brand of Winnie the Pooh stuffed animals includes plush versions that are anywhere from 14 inches to a jumbo-sized 32 inches. Disney: This brand includes the "classic" Winnie the Pooh without clothes along with the version with the red shirt. Sizes average from 7 inches to 12 inches. Some versions come with a scarf and are made from mohair. GUND: GUND focuses specifically on the classic designs of Winnie the Pooh and the other characters. The GUND versions start at around 15 inches.